FOUNTAIN VALLEY, CA--(Marketwired - May 30, 2016) - HeartStitch, Inc. today announced that it has received recertification of its EC certification and its ISO13485 after a successful audit by its European notified body. This successful audit certifies HeartStitch® to manufacture and sell its NobleStitch™ EL PFO Closure and cardiac suture product throughout the European Union. Prof. Anthony Nobles, CEO of HeartStitch® commented, "Our record in the European Union for Regulatory Affairs and Quality Assurance remains exceptional, and our commitment to safety and efficacy reflects this. These successful audits and re-certifications demonstrate the internal standards set by our committed team of manufacturing and quality staff. It also was an exemplary demonstration of Faye Dunn's skills in preparation of a CE audit shortly after joining HeartStitch." Ben Brosch, President of HeartStitch® commented, "Europe remains our largest market, and these certifications make it possible for us to continue to supply our NobleStitch™ EL products to the doctors, hospitals and patients that need these treatments. We are very proud of the level of quality and safety that they represent." Rich Babcock, Director of HeartStitch® commented, "We recently hired Faye Dunn, Director of Regulatory Affairs and Quality Assurance, who joined HeartStitch® just prior to the audit and immediately provided the same high level of standard that we require in HeartStitch®. Her contribution has already added to the strength of our systems." Edith Ramos, Quality Manager of HeartStitch® added, "It was a large task to add the NobleStitch™ to the system merely two months before a major CE audit. The team worked all the necessary hours to be ready, while maintaining the high standard that Prof. Nobles holds us to. We are all dedicated to keeping the highest level of quality for our products." A PFO is a relatively common heart defect characterized by an unsealed tunnel between the right and left atria of the heart. This defect has been known to be present in anywhere between 27%-38% of people. However, in a number of cases, it is benign. The PFO is formed as a trace of the fetal circulation. When the chambers of a human heart begin to develop, a tunnel is made between the right and left atria, allowing blood to flow directly from the venous circulation to the arterial circulation, circumventing the non-functioning fetal lungs. Following birth, the pressure differential between the right and left atria changes with newly operational blood flow to the fully functioning lungs. Because of this, the tunnel eventually closes completely within the first few months. However, in some patients, the foramen ovale fails to seal and stays "patent". 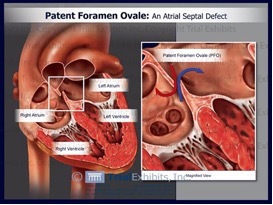 In patients with a Patent Foramen Ovale (PFO), the tunnel can reopen under elevated atrial pressure, such as coughing, or straining. A key issue with PFO is that it gives a pathway for blood clots to pass directly to the arterial circulation without being filtered out by the capillary bed of the lungs. A PFO can also let deoxygenated blood and certain chemicals cross over to the arterial side. The presence of a PFO has been linked to a number of clinical issues, mainly strokes, migraines and chronic fatigue. Developments are being made to solidify the link between PFO and strokes or migraines, and to identify patients that would benefit from PFO closure. HeartStitch® Inc. was founded by Prof. Anthony Nobles with the intent of leveraging its technologies in the structural heart marketplace. HeartStitch® is focused on innovative suture-based systems for remotely providing suture repair of structural heart defects and other vascular structures. The HeartStitch®TA and HeartStitch®MR are FDA cleared for vascular suturing in the United States. HeartStitch® manufactures and markets the NobleStitch™ EL under exclusive license from Nobles Medical technologies II, Inc. NobleStitch™ EL is FDA cleared for vascular suturing in the United States and CE Marked for cardio-vascular suturing and PFO closure in the European Union and the Republic of Kazakhstan, respectively. HeartStitch® is a registered trademark of HeartStitch, Inc. Covered by or for use under U.S. and international patents including one or more of U.S. Patent Nos. 5860990, 6117144, 6245079, 6551331, 6562052, 6733509, 7004952, 7090686, 7803167, 8197497, 8348962, 8469975, 8496676, and 8709020. Covered by or for use under U.S. and international patents including one or more of U.S. Patent Nos. 5860990, 6117144, 6245079, 6551331, 6562052, 6733509, 7004952, 7090686, 7803167, 8197497, 8348962, 8469975, 8496676, 8709020, and 8771296. Covered by or for use under U.S. and international patents including one or more of U.S. Patent Nos. 5860990, 6117144, 6245079, 6551331, 6562052, 6733509, 7004952, 7090686, 7803167, 8197497, 8197510, 8246636, 8348962, 8372089, 8469975, 8496676, 8709020, and 9131938. About this company HeartStitch, Inc.